For some years I was principal cellist in each of the orchestras that Sir Charles Mackerras conducted regularly. He had noticed that our diaries often coincided: ‘I feel like the King of Prussia, with my own personal cellist!’ This was no accident. In the two shared seats (in the Philharmonia and Orchestra of the Age of Enlightenment) I carefully contrived to be there for his projects and when he invited me to guest in the Scottish Chamber Orchestra, I stayed. 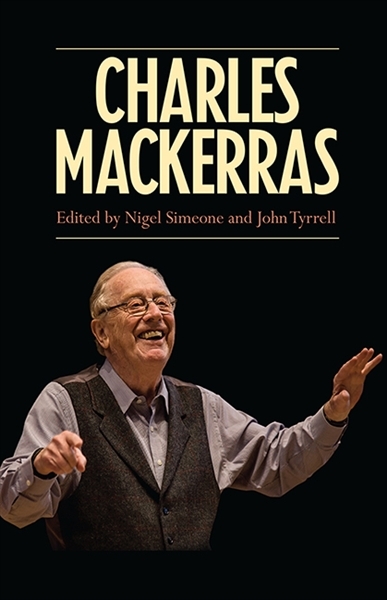 Reading Nigel Simeone and John Tyrell’s Charles Mackerras was a very touching experience for me, as I expect it would be for the countless others who were affected by his music-making. It was also an informative experience: for instance, I had no idea that he had conducted 110 operas by the time he left English National Opera aged 52! Young conductors could do worse than read it for programme ideas (in 100 pages of detailed appendices), for ideas on managing your forces (such as his letter on being appointed to ENO) or simply for its countless insights into an inspiring and selfless life dedicated to music. This is a thoroughly researched biography, where Mackerras’s voice leaps off the page in excerpts from his correspondence—I even felt slightly uncomfortable reading a letter to his mother about his rivalry with Colin Davis. Woven through its fabric are tributes and reminiscences from many who knew him, including an especially touching memoir by Patrick Summers, an account by John Stein of his extraordinary time at Welsh National Opera, and a piece by Rosenna East which beautifully captures his relationship with the SCO. Rather than strive for stylistic consistency or eliminate repetition, the editors allow these diverse contributors to speak in their own voices. Indeed, whether the tributes come from worlds where he was a pioneer—Janáček scholarship, or performance practice—or from the opera house or concert hall, it is the very recurrence of themes itself which is telling: life-long curiosity, learning lightly worn, and a demanding yet humble dedication to the composer. For some older players, and most singers, ‘demanding’ could be something of a euphemism, an issue not shirked by the book. Hailing as he did from the age of the tyrannical big-personality maestro, it was this uncompromising desire to serve the composer that set him apart. Richard Morrison recalls being in an amateur choir performing The Creation: ‘He growled and grunted; cajoled and coaxed; insisted and inspired. Not on his own behalf, of course, but on Haydn’s’ (p.201). Those older players would grudgingly admit that he possessed an uncanny tempo equivalent of ‘perfect pitch’, not a gift but the result of hard work. He could switch from two to four beats per bar exactly and give upbeats in the speed he wanted (surprisingly rare skills). He always knew what players and singers needed, never too proud to give more than one upbeat. But it was his control over very subtle differences in tempi which—spread large-scale over a whole Mozart opera or Brahms symphony—allowed him to pace the drama of his performances. In 1966, when massed choral societies were the norm, Mackerras recorded Handel’s Messiah with small forces, lively tempi and vocal ornamentation. His interest in historically informed performance practice, long before it became fashionable, was neither antiquarianism nor iconoclasm but another way into the composer’s score, the duty of any performer. For example, his fascination with Steinbach’s advice on Brahms was not a stricture but a mind-opening encounter. Film of those Messiah sessions (on YouTube) shows how long ago it all was—the bass, Raimund Herincx, is chain smoking! Another sign of the times comes in a manifesto for opera conductors written to management during his Sadler’s Wells/ENO days, asking ‘How does Scottish Opera manage to afford so many international, ex-Wells singers which the Wells cannot?’ (p.31). When he invited me to the SCO for La Clemenza di Tito it was my first experience of doing opera with him. At the first recitative rehearsal I told him about the work I had been doing on the eighteenth-century practice of accompanying recitative with chords on the cello. The 80-year-old Mozartian (with more operatic experience than the whole room combined) grudgingly said he would give it a try. At the end of the rehearsal he beamed toothily ‘I love it!’. It was this flexibility and openness that was both a symptom and a cause of his youthful approach. From then on he insisted on cello chords in recitative wherever possible. This was a rod for my own back, as he was intensely interested in all aspects of recitative, making detailed suggestions about chord positions, character, colour, bow strokes and so on. Once he knew that I was interested in conducting he immediately insisted that the cellist attend every recitative rehearsal—not usually considered necessary, but a hugely rewarding learning experience for me. His ‘Three Orchestras’ loved hearing his stories—the story behind the famous East German parts he brought with him, paid for out of his fee in ostmarks. Printed on fragile Cold War paper and covered in corrections in his own hand, they were a strange palimpsest of years of practical experience and the latest scholarship. Some might have found these parts ‘controlling’. For others they were a practical time-saving way of getting what he wanted: his own distinct sound and his own very detailed ideas about the music, whilst letting orchestras retain their own character, whether the OAE, SCO, the Philharmonia, or the Czech Philharmonic. (In his hands the soloist in Dvořák’s Cello Concerto didn’t have to play sempre ff.) He enjoyed telling the story of his completion of Mozart’s Rondo for Piano and Orchestra, K386. Mozart’s autograph had been cut up into postcards by Thomas Attwood and posted out to his friends in a strangely misplaced act of reverence. Completing it presents an unusual challenge—rather than missing one line, or needing finishing, different parts are missing at different times. Every few years lost segments came to light in auctions. He delighted in having his work gradually marked by the master, proud as a schoolboy that his rate was close to 50 percent! Those who were lucky enough to be at those Mozart symphony SCO/Linn Records recording sessions all realised they were witnessing something exceptional, remembering a beatific smile appearing during odd moments that tickled his fancy—his own sheer, humble pleasure at the smallest details in the music. I had my own insight into that humility during those Mozart sessions. In justifying his lightning fast menuets, he mentioned research which saw them as precursors to Beethoven’s scherzo. I asked him about it in the break and he referred me to an article. That night I downloaded it from JSTOR and was astonished: it was a tirade against modern conductors taking menuets too slowly—the chief culprit, one Charles Mackerras. David Watkin read Music at Cambridge, studying the cello with William Pleeth and singing with Kenneth Bowen. Solo recordings include Vivaldi, Haydn, Beethoven and Francis Pott. His recent Bach recording was hailed as ‘revelatory’ (BBC Music Magazine) and ‘a triumph’ (Gramophone). With the Eroica Quartet he has recorded Beethoven, Mendelssohn, Schumann, Debussy and Ravel. He has been a soloist at Wigmore Hall, Barbican, Royal Festival Hall, Queen Elizabeth Hall, Carnegie Hall, New York and performed the Schumann Concerto with Sir John Eliot Gardiner and ORR at Lincoln Center, New York. As guest artist he has collaborated with, among others, the Tokyo Quartet, Robert Levin and Fredericka von Stade. He has been Principal Cello in some of the world’s leading ensembles, including English Baroque Soloists, Orchestre Revolutionnaire et Romantique, the Philharmonia Orchestra and the Scottish Chamber Orchestra, and has worked under, and received guidance from, some of the leading conductors of the age. In conducting, the breadth of his musical background—academic and practical, ‘early’ and modern, vocal and instrumental—gives him a unique perspective. He has conducted the Scottish Chamber Orchestra, RSNO, the Swedish Baroque Orchestra, the Academy of Ancient Music, the Meadows Chamber Orchestra and at the Royal Academy of Music, the Guildhall School of Music and the Royal Conservatoire of Scotland, where he is now Head of Strings.